We visited Malaysiain 2010. We stayed in Kuala Lumpur (KL) for a few days before flying up to Penang for a couple of weeks. The food of Penang was the main draw card for us, plus Malaysia was one of the few countries in the region that we had yet to visit. It was our first overseas trip with our children. 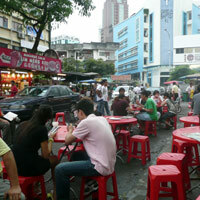 List of Malaysian Hostels and a link to a booking form. Guide to Places in Malaysia. 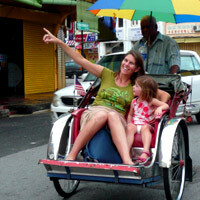 Here is a quote from a local with some suggestions of places to go and things to do in Malaysia. "If you plan to come to Malaysia, remember to go to Redang Island or Perhantian Island if you like beaches. Or Genting Highlands or Cameron Highlands if you like the high mountains. Cameron Highlands is famous for tea. And please visit Ipoh for good and cheap food! Look around for the Famous Ipoh Chicken and Beansprout Noodles. And White Coffee at Ipoh Old Town (I'm from Ipoh btw). Don't miss out Penang for its temples and food too. I guess KL should be one of the destinations but I guess it has quite a lot of publicity already."